With its CO2ncept-10 % vehicle based on the Porsche Cayenne, Schaeffler is impressively demonstrating the improvement potentials that can be achieved through consistent detailed work on vehicles with internal combustion engines. In the case of the CO2ncept-10 %, these optimization measures cover detailed solutions that are already available or close to volume production, but do not touch the vehicle’s basic configuration. The optimization of the classic drive train also includes the use of electrified components instead of the previous hydraulically actuated elements. Various new and optimized proven components from Schaeffler’s product range are used in the CO2ncept-10% vehicle in the drive train and chassis that significantly reduce the fuel consumption compared with a volume-produced vehicle. The engine is responsible for 5.8% of the reduction in fuel consumption and the CO2 emissions associated with this. The main proportion of this – 4.1% – was implemented by modifying the VarioCam Plus valve control system by replacing the hydraulic camshaft phasing unit with an electromechanical system and by using optimized switchable tappets on the inlet side. An additional 1.7% was realized by the minimized frictional power by optimizing the components in the valve, belt and chain drive systems. A further 1.1% reduction in fuel consumption is achieved by using double row angular contact ball bearings in the front and rear differentials. These so-called TwinTandem bearings replace the tapered roller bearings previously used and significantly reduce the frictional resistance compared with conventional volume-produced transmissions by 35% on the front axle final drive unit and by 42% on the rear axle final drive unit. 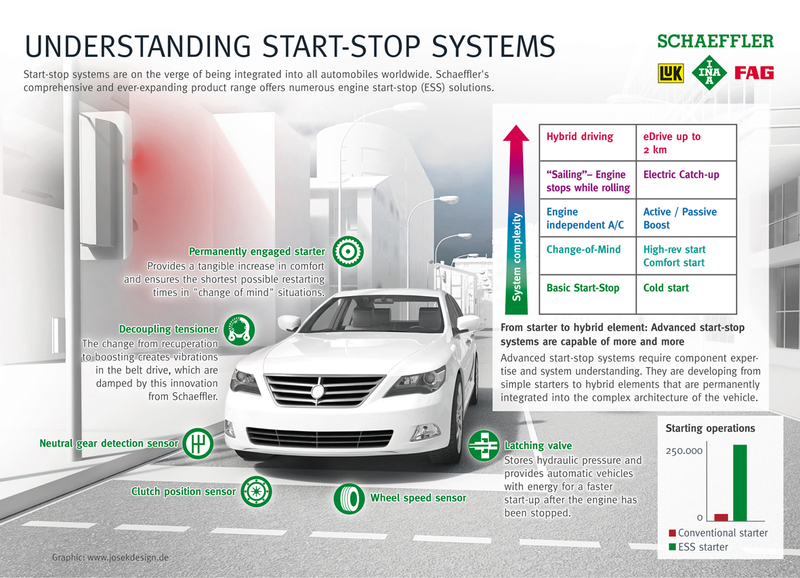 Schaeffler considers itself a partner for different start-stop concepts with its broad technology portfolio. The most efficient possible use of the electric power available from the start-stop system installed in the vehicle is one of the engineers’ development goals. 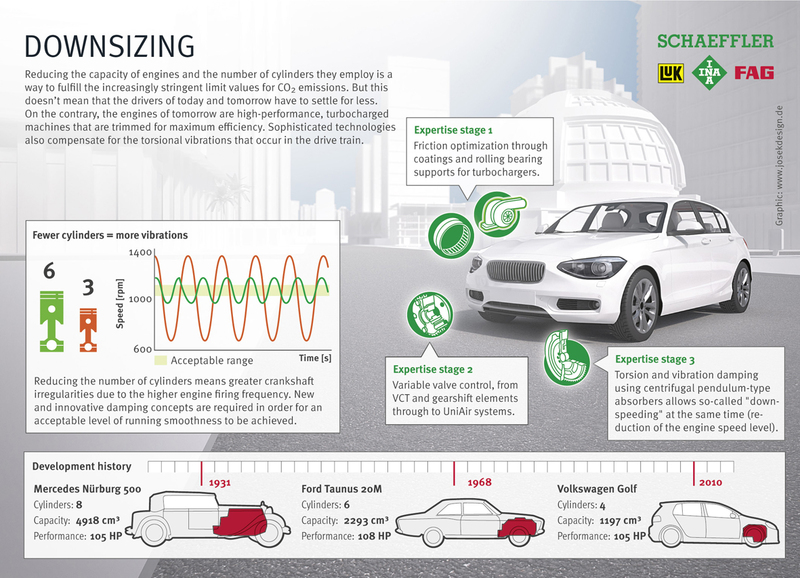 An increase in the internal combustion engine’s load point for operation in the ideal operating range, requirement-based operation of the accessory units, regenerative braking, boosting, and sailing are all indispensible when it comes to fulfilling future emissions regulations. Reducing the capacity of engines and the number of cylinders they employ is a way to fulfill the increasing stringent limit values for CO2-emissions. But this doesn't mean that the drives of today and tomorrow have to settle for less. On the contrary, the engines of tomorrow are high-performance, turbocharged machines that are trimmed for maximum efficiency. Sophisticated technologies also compensate for the torsial vibrations that occur in the drive train.